Few writers have a more enduring legacy than the English Romantic poet John Keats. Born in October 1795, Keats set out as a medical student studying at Guy’s Hospital and was eventually recognized as a central figure of English Romanticism. We think that we know Keats – the young poet who died tragically of tuberculosis, aged just 25; but identifying Keats in this way not only limits our understanding of his genius, we risk misreading him entirely. 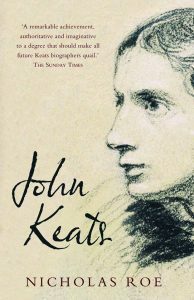 In his recent biography John Keats. A New Life Nicholas Roe presents a Keats who is more robustly attuned to life and actuality. He vividly evokes the poet’s day-to-day life in London, at theatres and booksellers, dining with friends, and hiking in the Lake District and Scotland. This new biography portrays Keats as a poet whose work was influenced by the places he visited; his poem Endymion, for instance, was written at the Isle of Wight, Hampstead, Oxford and Box Hill and each section of the poem responds to the location in which it was composed. Far from languishing on a chaise, Keats as a man and poet was vitally engaged with and responsive to his world. This interview occurred just before a lecture given as part of the Plymouth Literature Festival. The lecture, ‘Charles Brown, John Keats and Plymouth’ reassessed the life of John Keats and the role Keats’s friend Charles Brown had in preserving the poet’s work and ensuring his reputation. During our interview, we also talked about how biography can shape our perceptions. Can you remember what initially drew you to Keats? Yes, I think the sound of his poetry—its sonic energy—long before I had any more reflective sense of what the poetry might ‘mean’. ‘Season of mists and mellow fruitfulness’: you only have to sound the line once and you’re drawn in. What qualities (personal or poetic) do you think separate Keats from other key figures of the Romantic period? Keats is unique in the remarkably rapid development of his genius. The poems that survive from 1814 to 1820 move from imitative verses, to complex, highly original lyrics that altered the course of English poetry. He discovered his own poetic domain very early. Keats’ extraordinary strength and self-belief when life, circumstances, health and critics all seemed allied against him are what impress most of all. Andrew Motion’s biography of Keats gives us a panoramic view of the poet’s life, whereas your biography goes into much finer detail. Why did you adopt this approach? My biography is interested in the locations of his writing and how these found their ways into his poetry, for instance in my account of the ‘The Eve of St Agnes’, written at the Old Mill House in Bedhampton in January 1819. This is very much a grounded Keats, a poet responsive to reality – not ‘poor Keats’, as the Victorians called him. Keats had walked the wards of Guy’s Hospital, and his poetry is braced by memories of that awful experience; probing a woman’s neck to extract a pistol-ball; dissecting muddy resurrected corpses. Keats’s experiences at Guy’s are central to understanding the kind of poet-physician he became. What was Charles Brown’s significance to Keats? Charles Armitage Brown met Keats in the summer of 1817; he may not be well-known today, but he swiftly became Keats’s collaborator and advisor and a guardian of his reputation as a poet. Brown gives us numerous insights into Keats’s life as a writer that we would not have had otherwise — indeed, without Charles Brown, Keats’s life would have taken a very different course, such that we would probably not have many of the poems. The ‘Nightingale Ode’ was written in Brown’s garden, and the ‘Eve of St Agnes’ was written in the house of Brown’s friends: had Keats not been in those places, the poems would in all likelihood not have been written. Keats would not have accompanied Brown on his summer Scottish tour in 1818, so we would not have his marvellous journal letters to his brothers and poems about Burns, Ailsa Rock, and Ben Nevis. There would be no Hyperion, at least as we know it, for Keats based the scenery of his poem on the Scottish Highlands; had Keats not gone to Winchester with Brown in August 1819, ‘To Autumn’ would not exist. It goes without saying, then, that we would not have Brown’s wonderful portrait of Keats, or his recollections of his poet-friend in his pioneering biography — a biography that is truly irreplaceable, in that it provides information about John Keats unavailable to anyone else. Do you think we can ever reach a definitive account of a writer’s life, or will revision and reinterpretation always be the way forward? Literary biography is never definitive, although publishers like to see the word in their blurbs. Half a century ago ‘To Autumn’ was regarded by an eminent Keats biographer as ‘one of the most perfect poems in English’, largely because the poet is ‘completely absent’. Surely Keats’s personality is heard in every word of that poem, in the sound and rhythm of every line, even though Keats doesn’t use the word ‘I’ in the lines? So, yes, revision and reinterpretation always lead forward — reinventing the life anew. No biography is ever the last word. Finally – what’s your favourite Keats poem?